Consider an organization which hires employees based on a certain no of factors. If we sit down writing all the rules on which basis are the employees going to be selected and then code them in form of an if-else loop, it might take a long time to figure us out what the rules are depending on the features and what rules need to be specifically set out for each. Also, some features might be having a higher weight (they are more important than others, eg- java programming is more important than all others), so rules have to be set around for them differently. Consider the fig. given below →Here x is all of our input(10,12..)all of this together forms an input x for function f(x). Our aim here is to replace human with a machine and the machine will figure out the function and the parameters for our function y=f(x1,x2…….xn). Our decision relies on this function, but here we don’t know the rules as well as what weights have to be assigned to different parameters. Here what machine does is, look at the inputs, look at the outputs and try to figure out a function which best explains the relationship between input and output. This in no way is easy for humans to do, taking a 25degree polynomial and finding out all of its parameters. Consider, y=ax³+bx²+c, we need to learn the parameters a,b, and c. So, what our machines do is it assumes all data points are related by some function and it tries out all the parameter values for it and tell us what function and what parameters best describe the relationship between x(inputs) and y(output). Once we get that function, we just need to code up that function and for any new input, we could derive the output by plugging into that function. How do we define these function? 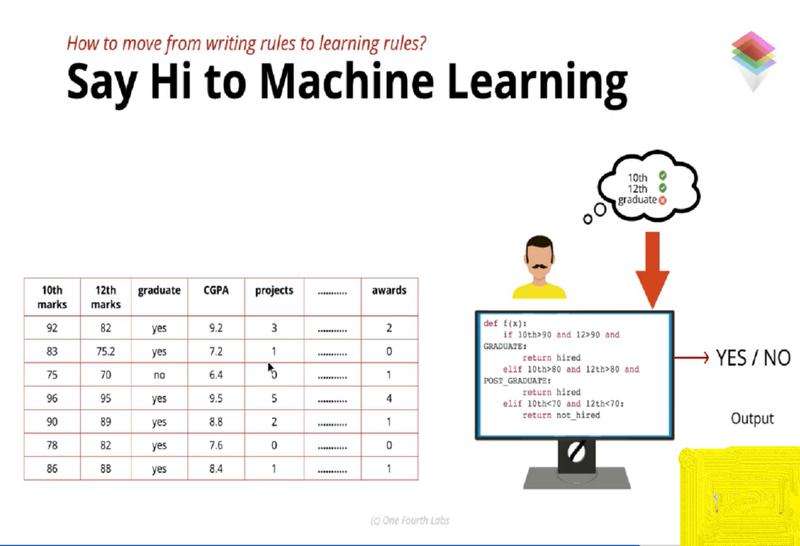 Machine learning is all about identifying these functions and how to learn the parameters of these functions. One family of machine learning algorithms, which is the deep learning algorithms, will helps us in estimating parameters of such functions. Why has Machine learning become so famous as of now? 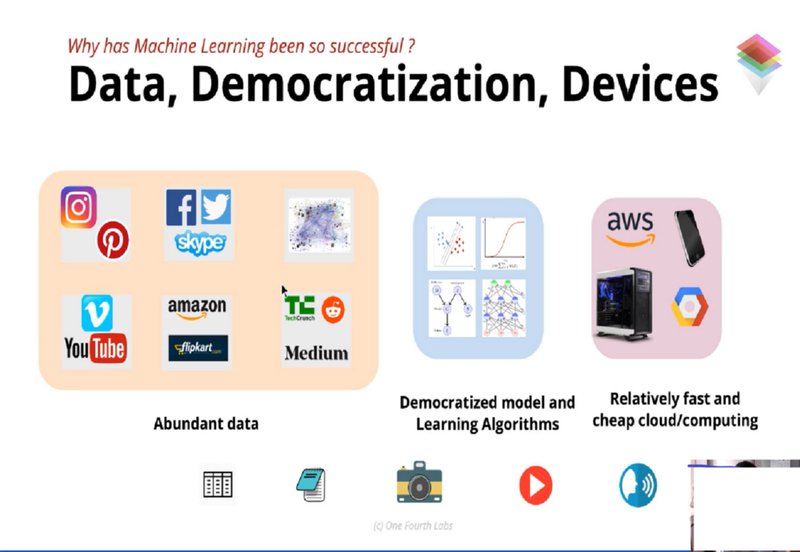 The three main reasons for the evolution of machine learning are- Data, Democratization, and Devices. 1 Data →The main part of learning complex functions for the machine is the data. And today, with the ease of availability of the internet, a large amount of data is continuously being uploaded on the internet. Structured Data, Text Data in the form of reviews, images of the product and so on, so a lot of data is easily accessible to us on these platforms which could help machine easily learn about the parameters and make more sense of data. 2 Democratized model → People have already released their code for how to train a deep neural network. So, we all have access to the code where we can just feed in our data and know the relationship between input and output. This is my first article for machine learning. I will be writing a lot more from now on, especially about deep learning. If you liked the article, please share it. Feedbacks are most welcome.